For deeper understanding of Scientology, I recommend reading Going Clear; Scientology, Hollywood, & the Prison of Belief by the Pulitzer-Prize-winning reporter, Lawrence Wright. I will touch on a few facts related to the death of L. Ron Hubbard, the founder of Scientology. Scientologists believe that everyone has a “reactive mind” and an “analytical mind.” The reactive mind stores pain and emotional trauma in the form of “engrams” – mental images unavailable to the analytical mind. The reactive mind is the hidden source of irrational behavior, unreasonable fears, and insecurities. The Church of Scientology uses a process called “auditing” to eliminate engrams. Scientologists use a mixed metaphor to describe their spiritual progress: eliminating engrams allows believers to move “up” to higher levels on the Bridge to Total Freedom. It is a toll bridge because the church charges for auditing sessions and the cost can be quite high. A sufficient amount of money allows the believer to become “clear.” “Clear” is a state in which a person has eliminated the reactive mind. 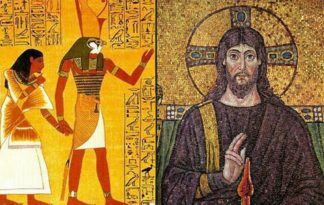 According to Scientologists, Jesus and Buddha were clear or perhaps a little bit better than clear. However, they did not achieve the next level – Operating Thetan. I don’t know exactly what that means, but the general idea seems to be that OTs are large and in charge. Which brings me to the death of L Ron Hubbard, affectionately known to his followers as LRH. Hubbard had supposedly traveled higher up the Bridge than any human – so far that he should have been immune to illness, age or infirmity. However, that theory did not work out so well in practice. Of life’s two great inevitabilities, Hubbard did a pretty good job of avoiding taxes, but no one escapes death. 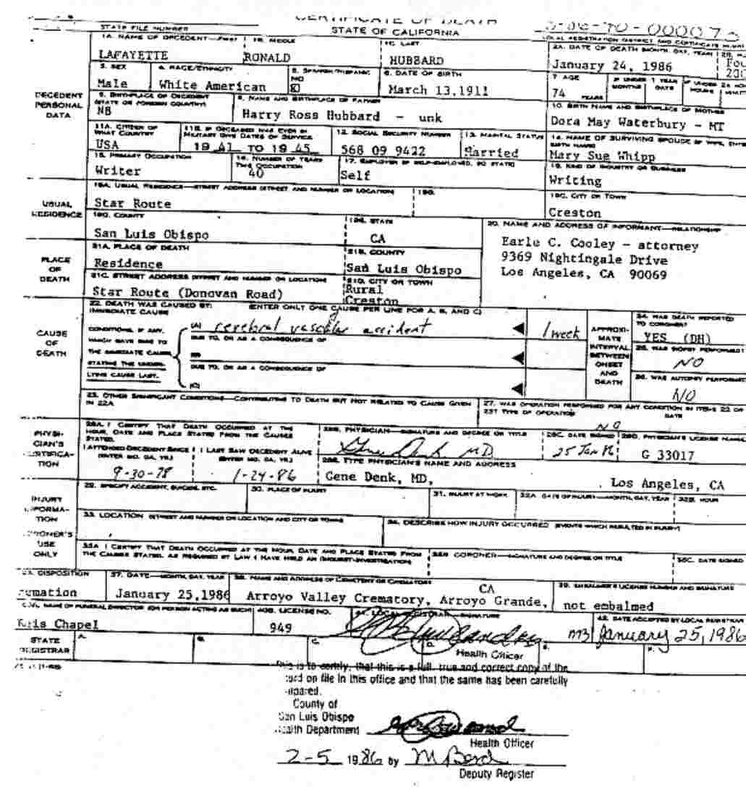 Scientology’s leader did not appear in public during the last six years of his life. As he grew older, Hubbard became living – or rather dying – proof that Scientology cannot deliver the fantastic powers for which believers pay large sums of money. During his last three years on this earth, Hubbard kept himself in virtual isolation in an expensive 1982 Blue Bird mobile home parked at a ranch near San Luis Obispo, California. Only a few church leaders knew about his declining health, and most of them did not know his secret location. Hubbard suffered a severe stroke on January 16, 1986. He realized his days were numbered, and he wrote a new will. He then died in the Blue Bird mobile home on Friday, January 24. Pat Broecker, one of the few people who knew Hubbard’s address, guided a group of the church’s senior executives to the hideout. They arrived at about four o’clock in the morning. At 7:30 Saturday morning, Earle Cooley, a church attorney, contacted the mortuary in San Luis Obispo and demanded an immediate cremation. However, the mortuary’s owner – uncomfortable with quick cremation of a celebrity – notified the coroner. The coroner ordered an autopsy. Scientologists are generally indifferent about what happens to bodies after a believer dies, and the church does not prohibit autopsies. 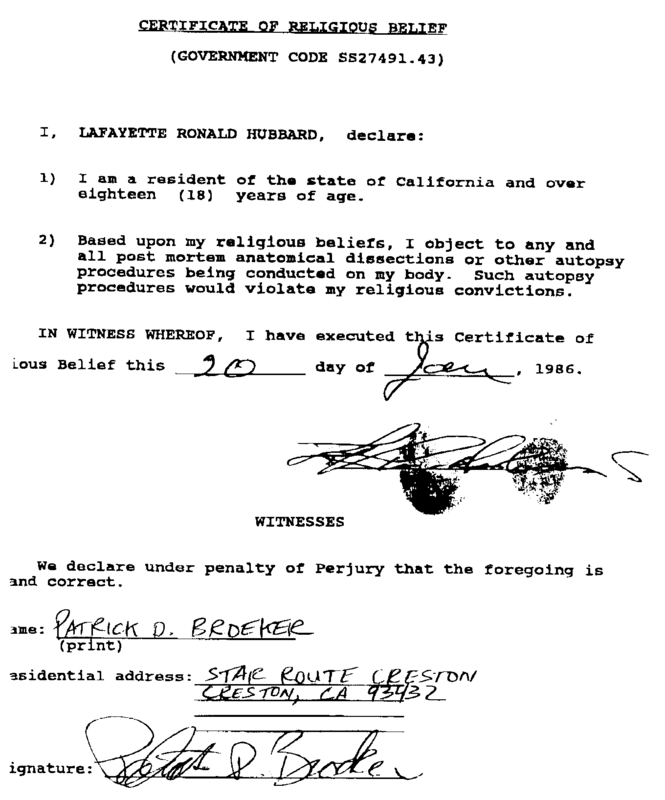 Nonetheless, Cooley produced a document signed by Hubbard on January 20 in which Hubbard stated that an autopsy would violate his religious beliefs. On Sunday, a funeral director scattered Hubbard’s ashes in the Pacific. On Monday, more than 2,000 Scientologists went to the Hollywood Palladium to hear a special announcement. David Miscavige, the church’s eventual leader, appeared on stage wearing the blue uniform of Sea Org, an elite organization of the church’s top echelon. He has now moved on to his next OT…level of OT research. This level is beyond anything any one of us ever imagined. This level is in fact done in an exterior state. Meaning, that it is done completely exterior from the body. At this level of OT, the body is nothing more than an impediment, an encumbrance to any further gain as an OT. Thus…Thus, at 2000 hours Friday, the 24th of January, A.D. 36 [36 years “after Dianetics”], L. Ron Hubbard discarded the body he had used in this lifetime for 74 years, 10 months, and 11 days. The official Scientology website now states that LRH passed away in 1986 and is no longer alive. They also maintain a $10‑million mansion that Hubbard will supposedly occupy after his reincarnation. At present, Hubbard is still dead, and the church still makes beaucoup bucks from auditing. Lawrence Wright, Going Clear; Scientology, Hollywood, & the Prison of Belief 16 (Alfred A. Knopf 2013). Unless stated otherwise, I summarized the following discussion from pages 181-84 of Going Clear; Scientology, Hollywood, & the Prison of Belief .